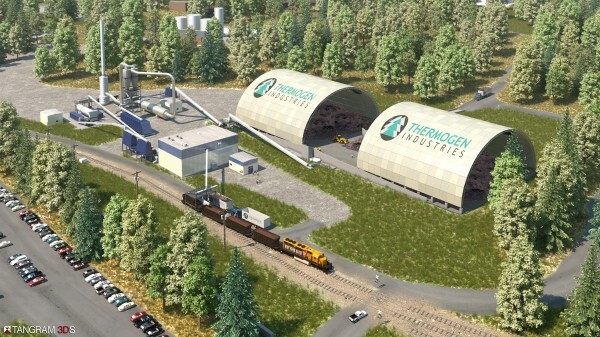 This rendering, provided by Thermogen, depicts the approximate design of what the torrefied wood pellet plant in Eastport would look like. Cash flow problems at an East Millinocket paper mill have left the business’s owners months behind in some of their payments to vendors, officials said Wednesday. But a company official said that Cate Street Capital and its subsidiaries, Great Northern Paper Co. and Thermogen Industries, are hoping pending emergency legislation can help them secure about $15 million in state tax credits over eight years for one of their projects. The credits are key to building New England’s first torrefied wood plant in Millinocket and creating or securing hundreds of jobs in Millinocket and in Eastport, said George Gervais, commissioner of Maine’s Department of Economic and Community Development. Cate Street, a New Hampshire investment company, owns paper mills in East Millinocket and Millinocket through GNP. Thermogen was established to manufacture torrefied wood, a type of wood pellet, in Millinocket and Eastport for sale to British and European coal-fired electrical plants. But state government can’t fix GNP’s cash problem, state Sen. Doug Thomas said. Thomas, R-Ripley, met with Gov. Paul LePage on Wednesday to discuss GNP’s problems. Thomas met with Cate Street leaders about a week ago after the company’s creditors approached him, he said. LePage’s staff reviewed Cate Street’s situation and found no need for state aid, Thomas said. “It is going to take some time” but the company seems intent on squaring its debts, Thomas said. Thomas said one creditor reported that GNP contacted it on Wednesday for wire-transfer information to get paid immediately. Another creditor told a Bangor Daily News reporter that it was paid Wednesday morning. One creditor as yet unpaid is the town of East Millinocket. Since Feb. 6, Great Northern has owed the town about $355,654 in property taxes, Town Clerk Erica Ingalls said. The company pays the town about $700,000 in taxes annually. Cate Street spokesman Scott Tranchemontagne attributed the cash shortage to the seasonal rise in wood prices caused by “mud season” — the spring thaw that makes wood harvesting more costly. GNP has no layoff or shutdown plans and the company isn’t seeking state aid for its cash flow problems, said Tranchemontagne, who described the company’s sales as strong. Tranchemontagne declined to discuss the payment plan. Besides selling newsprint, the company has been generating revenue by scrapping and salvaging material from its Millinocket mill site, Tranchemontagne said. “One hundred percent of that money is going back into GNP as part of this plan,” Tranchemontagne said. Historically, Cate Street’s predecessors, Brookfield Asset Management and Fraser Papers, shut down the East Millinocket and Millinocket mills annually in parts of April and May for maintenance and to better cope with mud season. A GNP competitor, Resolute Forest Products of Ontario, whose 300 employees produce about 500,000 tons of paper and pulp annually, last week announced a two-week halt to cope with a market downturn, according to Canadian media accounts. GNP’s strong sales make those moves unnecessary, Tranchemontagne said. The company has no plans to remove its No. 11 papermaking machine from Millinocket, Tranchemontagne said. The Millinocket Town Council has sought a meeting with Cate Street leaders to discuss the company’s paper and torrefied wood plans. No date has been set. Tranchemontagne said the first torrefied wood machine is one of five slated for Millinocket. Two or three more will be built in Eastport over the next several years, with the first Eastport machine coming online sometime in 2015. The first machine in Millinocket will directly employ 30 to 35 workers and create or sustain 80 to 100 jobs indirectly, he said. Each machine after will employ 20 to 25 directly with 80 to 100 jobs indirectly benefiting. But as with some of its creditor payments, Cate Street is late with those plans. The company announced in October 2011 that its Millinocket machine would be installed by late 2012. Company officials later pushed that date back to April 2013, but have yet to announce a construction start date. Tranchemontagne said the pending legislation that the Maine House approved on Tuesday would help the company secure financing. He said he hoped construction would start in Millinocket in a few months. The state Senate tabled a vote on LD 1109 on Wednesday and will resume deliberations on Thursday, Thomas said. LePage could sign the legislation into law this week, Thomas said. With the torrefaction machines in mind, state legislators had been working on the amendment, which concerns the state’s complex New Market Tax Credit program requirements, since January, Gervais said. The emergency legislation essentially allows the Finance Authority of Maine, which administers New Market credits, to help fund subsidiaries such as Thermogen when parent companies or other subsidiaries have already received credits, Gervais and Thomas said. GNP received a $30 million tax credit last year. The company was the first to benefit from Maine’s program. Under the program, Thomas said, investors receive tax credits two years after investing in a Maine company or its subsidiary.